As I mentioned in the last Game Dev Update, we're digging into the House system, and part of that is designing the way they'll display their whereabouts. Here's a quick look at the designs we're working on, from superstar concept artist @Hardcake. 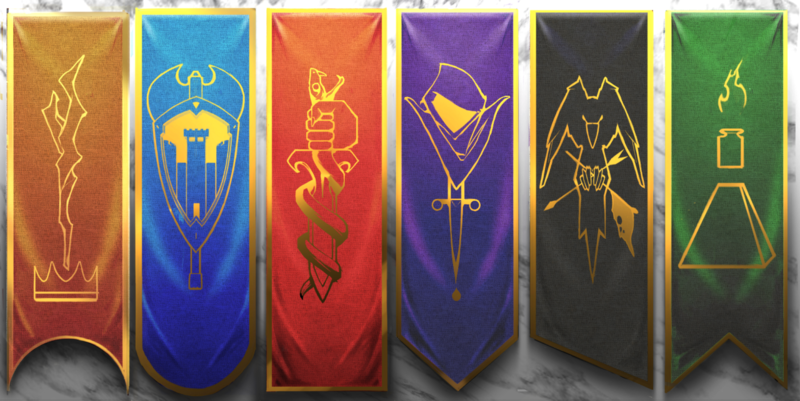 As I also mentioned, anyone who can guess ALL 6 Houses and which banner is which before I reveal them in a subsequent post, gets a special Legendary item at launch. Hint: one of these is Revenge. These look cool green one looks kind of alchemy styled? The red one healing medicine? I'm now thinking the black one is a raven so is wisdom? Haha indeed you need more clues, @helpicantfly, and you shall have them. And yes, the image on the black one is a raven. Using the Revenge example, it is called House Revenge, and each is like that-- it is "House" and then a unifying (single word) concept that the House is dedicated to. In Revenge's case, they're after vengeance! i don't know when do we get a clues ? My guess has been sent! @Darggie you guessed all six wow i'm still scratching my head and it hurts !! Where is the house that funk built? Also, how pedantic are you going to be about the words? If I say vengeance instead of revenge, am I wrong? Because House Vengeance sounds much more badass than House re-boring-venge-blahblahblah *fart noise*. Oh, I sent my guess a few days ago. I didn't want to break helps tangenting. i m thinking house revenge is the purple flag but its just a guess . I sent a guess in, but I don't know if they are right or not. I'm confident about one or two... but the others were just shrewd hunches. Probably spent 45 minutes studying the banners and researching for my guesses. Im actually leaning red for the revenge one. Grasping the serpents head is such a double edged blade that it fits conceptually in my mind. If the blade had been longer and not a dagger I'd have filed it under courage instead, but that clashes with the type of blade, along with the fact that the dagger is being thrust downwards, as opposed to being held aloft. @TheWizard Can I have my over-analysis trait yet? red is anger The symbol of the snake around the dagger however means "I live by fighting". I looked at the banners and thought "what would whizz do?" 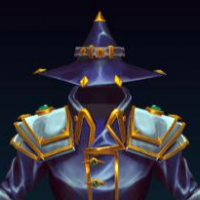 Wizzy is clearly a member of the first house. That's a gnarled staff, looks a bit like lightning, and has 'prepare to be smited' written all over it. The crown is just another reminder of who's in charge. /enjoys all of this immensely. @Finjinimo: I am anything but a pedantic wizard. Close counts. Also, we are considering changing a House to Giant Eagle Aaaaaaarrrrrgghhhh. Please note we'll be using one less "g."
@helpicantfly: I am impressed by your post volume in this thread. And you shall have some hints in the next House update, coming soon. And you are correct about Revenge. @kjelfalconer: Excellent Trait suggestion and if it's in the game, you shall receive credit. Also, yes, you get the Over-Analysis Trait for the purpose of this here forum! @whackapple: Solid guesses. VERY solid. However, they're also very wrong (not as wrong as Finji, who included a fart noise in his speculation). But, given your excellent reasoning, we are considering changing one to Utilitarianism. Not just wrong, very wrong? So like, the first one is just 'House Wizard'? As for the others, welp, all is darkness, depravity & despair. surly the banners should not be that hard to figure out ?if you want people to recognise them ? so i/we decided the gold staff and crown is the house your be in then .house olympus. i dont see one that fits @SingmeAsong maybe hes homeless ? It's not that the banners themselves are exceptionally hard to decipher. It's the fact that they are each a little ambiguous, and even if you narrow each banner down to one exact meaning, there are multiple words that can mean that same thing. Makes this a very trickly little game. Indeed it does. But getting your guesses also is helping us think about the symbols on the House banners and whether they telegraph the right thing. I've actually been pleasantly surprised that many of you have gotten some correct-- some of you with multiples. @TheWizard ...- if you want to lolligag in it, well-- that's up to you..
Also, you reinvigorating this thread made me realize that i did not, in fact seed any hints in that Game Dev Update, so I owe you guys. How about this next one?